Surrounded by sparkling waters and boasting brilliant views of Casco Bay, The Westin Portland Harborview offers luxurious accommodations and thoughtful amenities. Situated in the vibrant Arts District of Portland, Maine, guests are treated to a variety of activities, including cultural and historic sightseeing, shopping, and the beautiful outdoor recreation that New England affords. Built in 1927, the hotel opened as The Eastland and garnered fame as the largest hotel in New England, elevating the standard of luxury and hospitality. 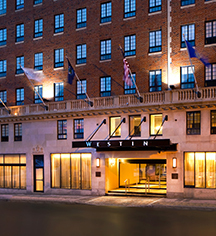 Today, The Westin Portland Harborview maintains its esteemed reputation and boasts 289 elegant guestrooms and suites, rooftop bar Top of the East Lounge, refined Congress Squared Restaurant, dynamic meeting and function venues, and gracious hospitality. The Westin Porland Harborview, a member of Historic Hotels of America since 2016, dates back to 1927. In 1927, The Eastland welcomed aviator Charles Lindbergh following his record-breaking solo non-stop flight across the Atlantic Ocean. Cancellation Policy: You may cancel before 6 PM on the day of arrival on a standard reservation. Cribs and Pack-in-Plays: Playpens can be provided on request at no additional cost. Deposit: Accepts VS, MC, AX, DS, DC, & Cash. 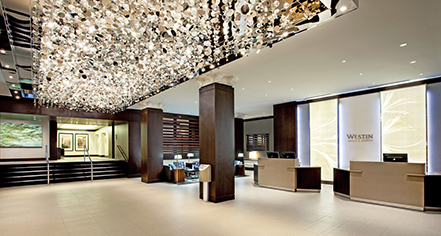 Early Check-In/Late Check-Out: Late Check-Out: Must be requested at the front desk and depend on availability. Please inquire at the front desk on the morning of your check out day. Extra Person Fees: While the hotel does not charge for up to 2 people, a $20 fee will be assessed per person, per night for up to 2 additional guests in the room. The maximum allowable occupancy is 4 people per room. Occupancy Restrictions: The maximum allowable occupancy is 4 people per room. Parking: On-site parking is not available. Paid parking is adjacent to our hotel at a cost of $24 per day. Valet parking is available for $34 per night. Pet Policy: Service animals allowed: Yes. Pets allowed: Yes. Restrictions: Maximum weight: 40lbs. Maximum size: Small. Rollaways: Rollaway beds are available for $30. Please make sure to request any rollaways when making your reservation. Transportation: Car rental service, may be arranged through the concierge; rates apply. Surrounded by sparkling waters and boasting brilliant views of Casco Bay, The Westin Portland Harborview offers luxurious accommodations and thoughtful amenities. Learn more about the History of The Westin Portland Harborview .